It is hard to believe that this past week I had my first surgery: I’ve been able to go through life un-sliced for the past 18 years – when I broke my first (couple of) bone(s). Before MTBing, the other two sports that lead me to the hospital more than once were horse show jumping and snowboarding, mostly because I was a vegan with a lot of blood-defiencies. My mother even asked me once why I couldn’t go back to Ballet which, for her, was more feminine and less dangerous. I love to push my limits in any sports I’m doing, which means I’ll get hurt no matter what. This first surgery was for an injury I’ve been neglecting since last summer but caught back to me this February. 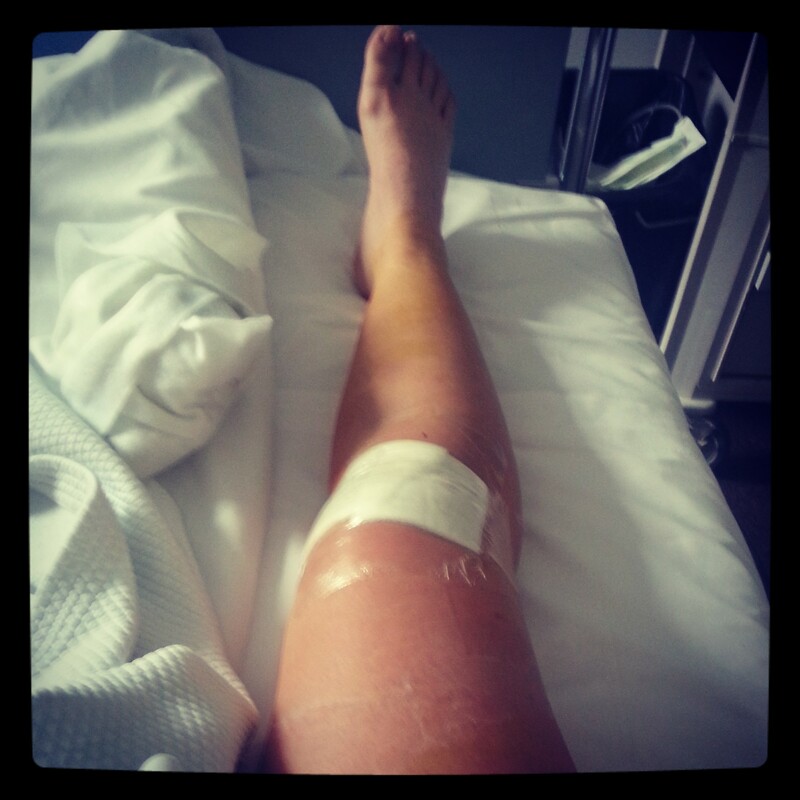 I tore my ACL in August in Whistler but as I’ve a high-pain tolerance, it didn’t bug me too much and I kept on riding. A few time over the winter I had this weird filling in my knee but thought it was just a sprain and it was always going away anyway – perhaps thanks to the muscle I had developed from riding or just because it wasn’t that bad at the time. Moving to Andorra meant less MTBing during the winter and going back to snowboarding: in early february, we had tons and tons of fresh pow and after 3 Californian winter I was stoked to get back to my first love. I tweaked my knee again but as the pow was so fresh, it was hard to not ride it. 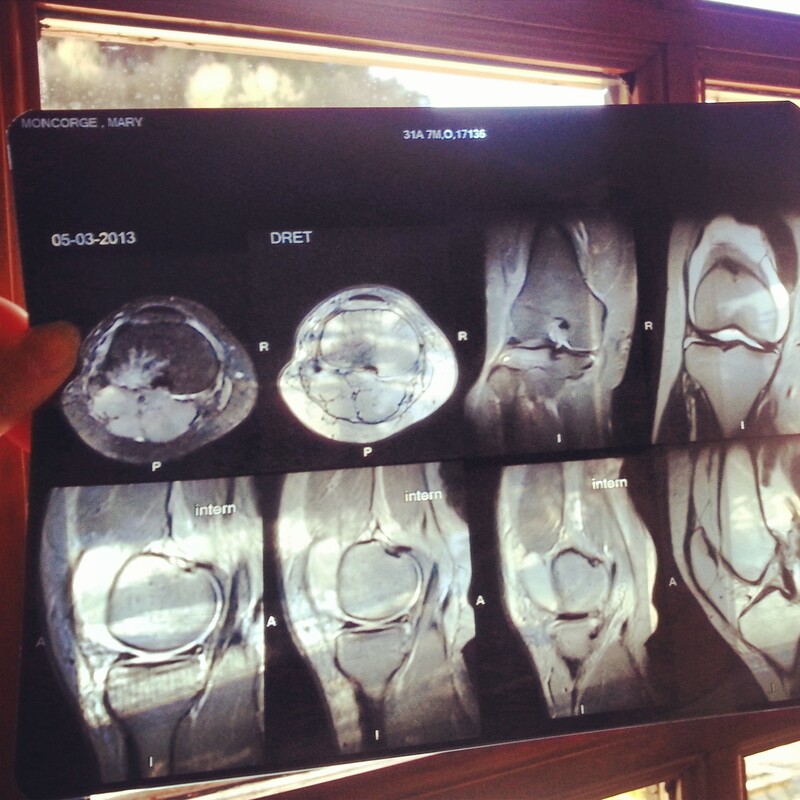 The following week, I went to Punta Ala, Italy to check out the possible courses of the fist Enduro World Series and did so on a bad knee, which lead to fully destroying it: fully ruptured ACL, partially ruptured meniscus, fractured tibia. I definitively did a grand slam on my poor knee. After meeting with the orthopedic surgeon (also, I’ve to admit that before I did the MRI, I went on racing and winning the Mondraker Enduro Series #1 in Las Gavarres near Girona, on my jacked up knee), I decided to opt for an external graft to fix my knee as efficiently as possible but also without damaging another part of my body by using a tendon or ligament to replace my annihilated ACL for faster recovery. I did a lot of pre-op muscle reinforcement to ease the post-op rehab and now 6 days post surgery my knee is less swollen, stitches are healing and I can put a little wait on my legs and start bending my knee. My goal is to be back in the pool as soon as the stitches are gone as well as at the gym to get my base muscles back on, back on the road bike in a month for intensified cardio and I’m planning on racing the 2nd EWS in Val d’Allos at the end of June.